"In Utah fry sauce is a must with fries. 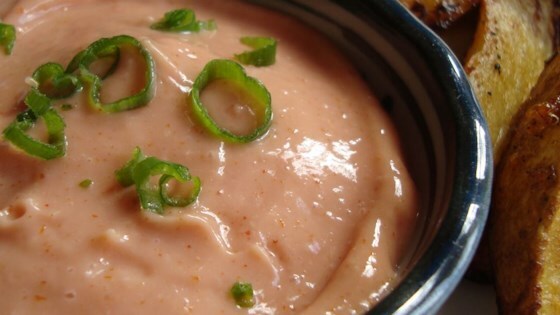 This is a spicy twist to the standard ketchup mayo mixture." Stir together mayonnaise and ketchup; season with cayenne, onion powder, pepper, and salt. This quick and easy side dish has delicate Asian flavors. Delicious! Im a Utah girl, so I'm very picky about my fry sauce! I made it with half ketchup half bbq sauce and it turned out wonderful. Thanks for the recipe! I did not care for this recipe. It tasted like tomato sauce with mayo! And as for the 'spicyness', there isn't any! Yep, add half bbq sauice and half ketchup to really make it pop! Try a splash of dill pickle juice or red wine vinegar and it really brings the flavors to life. Excellent recipe! Pretty good and a nice change from regular kethup for dipping fries - I added a little minced garlic. I multiplied this by four, added a tsp. of garlic powder and 4 baby dills that I chopped itty-bitty with my hand chopper. It's good now, but I think this will be even better tomorrow. This is pretty good, it doesn't have a lot of taste but it's a good addition to my home made potato wedges. I mixed in some extra cayenne for more kick. Excellent base sauce. I add some horseradish and minced manzanilla olives to the mix. Outstanding! I use it on burgers as well as fries and onion rings. Have any of you tried adding a little horseradish to this recipe? It'll give the zip you're looking for.